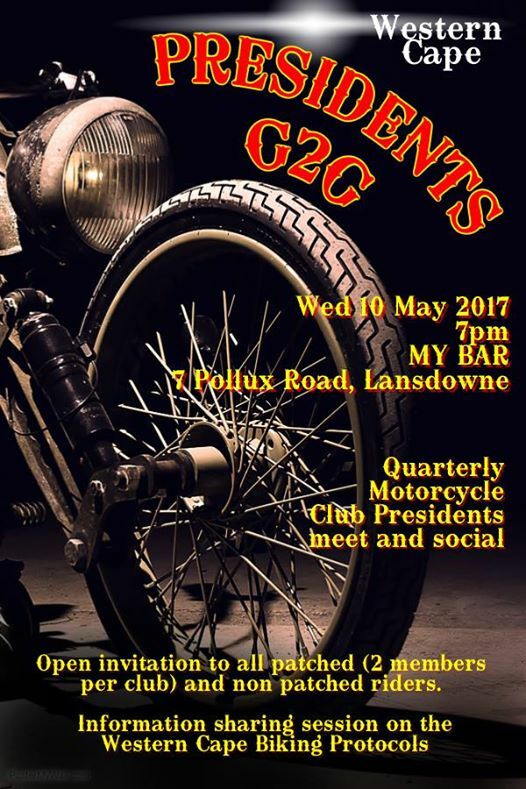 Open invitation to all patched (2 members per club) riders. This is an information sharing session and social event. 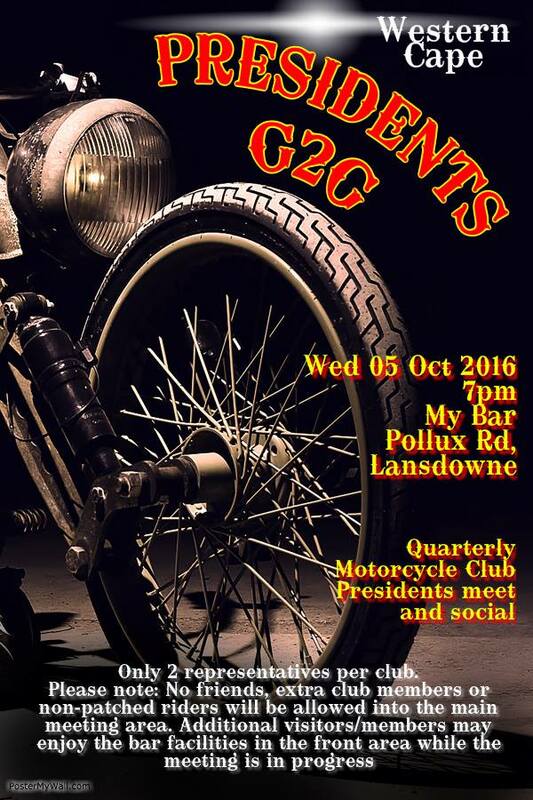 Topics of discussion include non-conforming protocol groups and moratorium on the opening of new chapters in the Western Cape. First time for everything!!!!! Bridging some gaps as this is an open invitation to non-patched riders!!!!! We are not looking at herding anyone in for a slaughter. As a matter of fact, this is the safest place as it is neutral ground where most club representatives come together to discuss biking in the WC, this NOT the MAWC and is attended by non-affiliated as well as affiliated clubs. 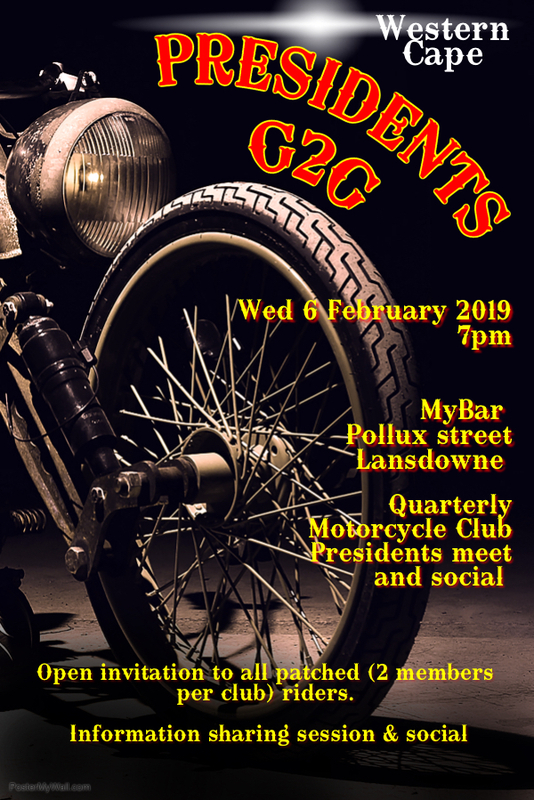 This is the opportunity for bikers who have questions, comments and opinions to come voice them, it's an opportunity that the club presidents in the WC are again taking to learn and grow. This is a great opportunity for business owners amongst us to come network as well. On October 5th 2016, the Western Cape Presidents Meet voted unanimously that a 1 year moratorium would be put in place on the start of new clubs.